Ion beam sputter deposition produces precise optical films of maximum density, purity and stability. The Reticle system from Angstrom Engineering offers a turn-key solution for those seeking to realize any optical design into a high-performance film. 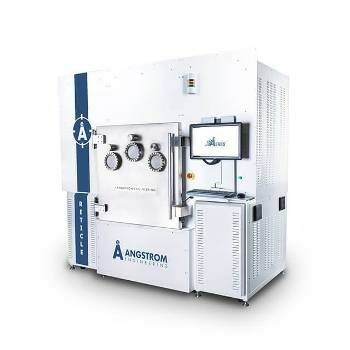 Angstrom has designed a platform that offers the optics community the capacity to develop films with exceptional purity, uniformity, and density, all in a highly repeatable and automated manner. This is a suitable system for applications such as highly reflective (HR) coatings, telecom optical filters, coatings for laser diode bars, anti-reflective (AR) coatings, as well as vanadium oxide deposition. Reticle applies this process, wherein a focused beam of extremely energetic ions is fast-tracked toward a target consisting of the material to be deposited. Thoughtful design of the ion beam focusing optics restrains the beam completely to the area of the target, removing any hazard of contamination. The IBSD process forms a highly energetic flux of deposition material, resulting in films with better hardness, density, and surface roughness compared to those deposited by evaporation processes. In contrast to conventional magnetron sputtering, IBSD occurs in a high vacuum setting, reducing noble gas inclusion in the deposited film and enhancing the environmental stability of the coating. IBSD processes can also use a secondary ion source for substrate heating for reactive deposition, substrate cleaning and energetic assist, and in-situ optical monitoring or ellipsometry for critical layer thickness termination. For precise and multifaceted optical coatings, ion beam sputter deposition can be selected. Which Reticle Do I Need? The substrate area to be coated, system throughput requirement, and target carousel configuration are the determining factors in choosing which of the standard Reticle platforms will best match the process. Whether the user is coating 100 micron wide laser diode bars or 300 mm diameter wafers, there is a Reticle platform that will achieve it. Reticle employs an assortment of gridded RF-ICP ion sources for high energy deposition. The sources available include 4, 10, 14, and 22 cm grid configurations with ion energies up to 1200 eV and beam currents over 1000 mA. Self-aligned ion optics is set up particularly for the preferred deposition needs and geometry of the user’s process. A selection of low frequency, radio frequency, or hollow cathode style neutralizer ensures consistent beam operation without contamination from a traditional filament. Operation of the RF-ICP source is handled by Aeres, integrating the power of full process flexibility with the simplicity of one-touch, automated recipe control. All standard Reticle platforms include an extra gridless end-Hall ion source with hollow cathode neutralizer. The end-Hall source is enhanced for ion-assisted deposition, substrate cleaning/etching, or reactive IBSD processes. For processes that necessitate deep substrate etching, an assortment of gridded DC or RF-ICP ion sources are also available. The deposition ion source is aimed toward a material target which has been enhanced in both position and size for the necessary deposition geometry. Targets are water cooled for enhanced process stability, and uninterruptedly rotated to avoid beam texturing. For multi-layer depositions, the carousel can be indexed automatically between targets, with up to eight positions available. Target rotation and carousel indexing each have torque-sense, avoiding any process issues because of slips or jams in rotation. Reticle can be configured for both ultra-high and high vacuum surroundings. High speed, magnetically levitated turbomolecular pumps act as the main high vacuum pump. An optional cryogenic pump enhances pumping speed, base pressure, and can be separated from the chamber during reactive processes involving oxygen. Low-profile chamber bake-out heaters take out moisture from the chamber walls and shielding, enhancing base pressure and total process stability. Together with sample rotation, the variable angle stage that is utilized for the Reticle offers for integrated angular motion via the deposition flux. Sweeping the tilt angle can enhance film thickness consistency and sidewall coverage, while also preventing high energy reflected neutral species for crucial processes. Each axis of motion is regulated via Aeres using precision servo motors, delivering better than 0.1 degrees of positional accuracy. Front side infrared heating bulbs tilt with the stage to offer a stable temperature profile for reactive processes. Planetary rotation incorporates a third axis of motion to the variable angle stage. The size, gear ratio, and position of each planet are enhanced to deliver Reticle’s best possible film thickness uniformity. Dynamic uniformity shaping is realized with a flux correction shield between the deposition source and the substrate. Each correction shield’s shape can be modeled and empirically enhanced for any process. Each correction shield can be tilted in-situ to detect the ideal balance between film uniformity and deposition rate. Control station PC with touch-screen handles each control variable on the Reticle, including primary and secondary ion sources, planetary and angular motion, power output, and target carousel. A secondary vacuum chamber can be annexed, enabling a substantial improvement in throughput. The main chamber must be kept pumped down to lower the chance of contamination and to eliminate the need for vent and pump down cycles for sample switches. While maintaining the main chamber at its base pressure, users can load a number of samples into the load lock chamber, enter all recipes in Aeres, and allow the system to take care of moving samples into the main chamber for processing. Angstrom’s Apex optical monitoring package includes in-situ optical monitoring. Angstrom’s unique design allows for direct as well as indirect monitoring of the variable angle stage, removing the need for tooling factors or a witness glass changer. In-situ ellipsometry offers crucial information on the performance of an optical film while it is being deposited. Layer termination from ellipsometric data is fully incorporated to Aeres. A range of multi-wavelength and spectroscopic ellipsometry solutions can be obtained. A shuttered QCM situated near the substrate offers feedback on the deposition rate and physical thickness of the growing film. Generally, a QCM is used to calibrate a preliminary deposition rate prior to completing the layer thickness under time control using a fixed beam current. Shuttering the crystal will radically prolong its service life during long processes or on systems with a load lock. Reticle 100 (left) and Reticle 200 (right).